Save 23% off the MSRP on bags of 50 Puritan 1805-PF RECT 5.172" Foam-Tipped Swabs w/Rectangular Tips and Polypropylene Handles (MFG Part Number: 1805-PF RECT) when you use our FPF032114 Coupon Code. This Featured Product Friday (FPF) promo is valid from today, March 21, 2014 through Sunday, March 23, 2014. 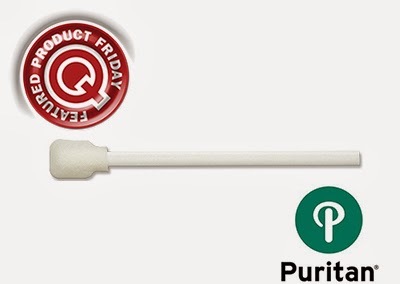 The Puritan 1805-PF RECT Foam-Tipped Swab (Q Source SKU: H015-000117) is a non-sterile applicator with a rectangular foam tip and polypropylene handle. The tip is reticulated 100 PPI medical-grade foam that is lint- and residue-free, soft, and non-abrasive. Regularly listed at $11.40, but with our FPF code savings you’ll get it for just $8.80 (a savings of $2.60). While this is a 3-day limited-time price, the coupon is unlimited. Use the code as many times as you like while it is valid—and please feel free to share the code with your friends & colleagues, too. Please note: This promo is valid only at QSource.com.